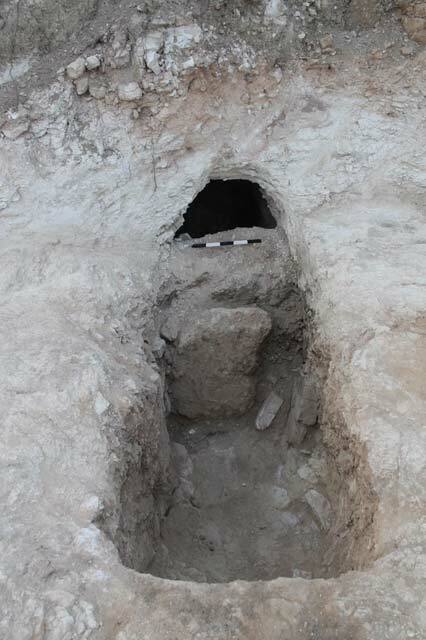 In November–December 2015, a trial excavation was conducted on the outskirts of Horbat Gannim in Moshav Yishʽi (Permit No. A-7536; map ref. 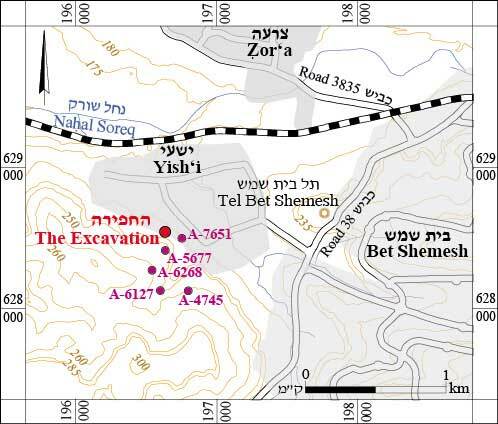 196752–861/628416–96), after ancient remains were discovered during preliminary inspections prior to the expansion of the moshav. The excavation, undertaken on behalf of the Israel Antiquities Authority and financed by Moshav Yishʽi, was directed by N. Ben-Ari (field photography), with the assistance of N. Nehama (administration), M. Kunin, A. Hajian and M. Kahan (surveying and drafting), A. Peretz (photography), Y. Tzur, A. Melman and Z. Turgeman (preliminary inspections), A. Eirikh-Rose (GPS), E. Belashov (plans), Y. Rapuano (ceramics; see appendix), A. Gyerman Levanon (pottery drawing), A. Goel (numismatics), N. Ben Melech (OSL), Y. Paz, E. Kogan-Zehavi, O. Sion and P. Betzer (consultation). 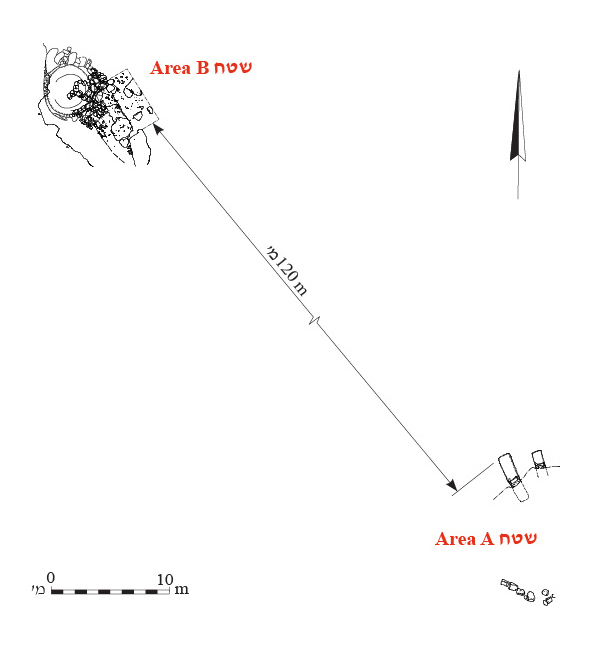 The excavation was conducted along the eastern fringes of Horbat Gannim (Khirbat Umm Jina), c. 1 km west of Tel Bet Shemesh (Fig. 1). The ruin extends across two spurs that descend to the north. Two areas (A, B; Fig. 2) were excavated c. 150 m apart. 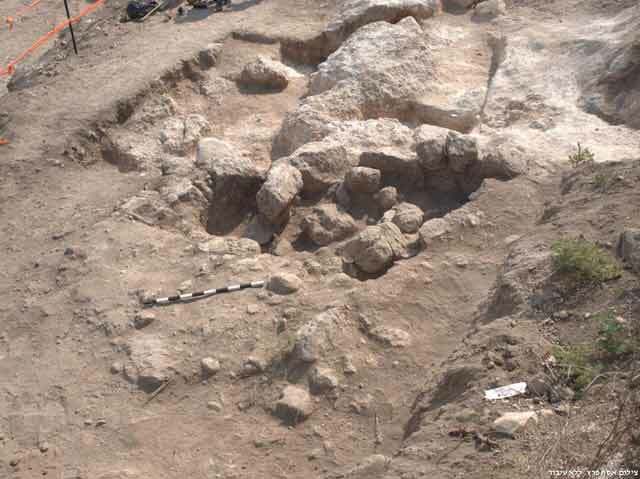 Two rock cuttings and remains of a wall were exposed in Area A, and a limekiln from the Byzantine period and/or the Early Islamic period was revealed in Area B, next to habitation levels from the late Hellenistic and Hasmonean periods. 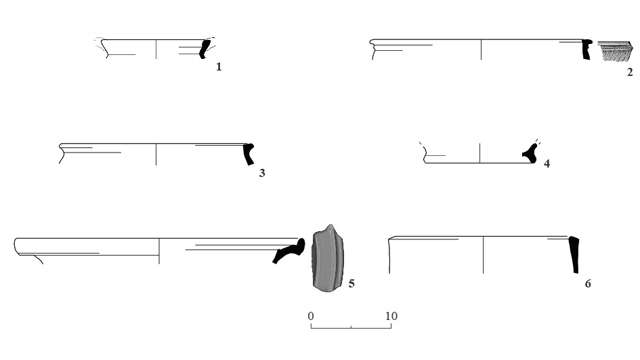 Settlement remains dating from the end of the Hellenistic period to the Early Islamic period were uncovered in previous excavations at Horbat Gannim (Kogan-Zehavi 2010 [Fig. 1: A-5677]; Kogan-Zehavi 2016 [Fig. 1: A-6268]; Ben-Ari 2017 [Fig. 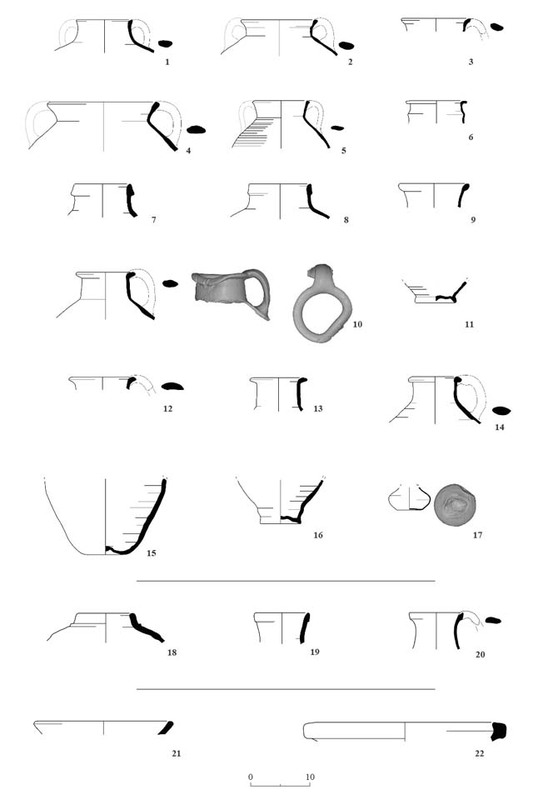 1: A-7651]; Sion and Rapuano 2017 [Fig. 1: A-4745]; Permit No. A-6127). Area A (Fig. 3). The area extended along the northern slope of the southern spur, yielding two rectangular rock cuttings in the bedrock (L100, L103; Figs. 4, 5). Both were blocked on the south by a stone slab, soil and rocks. The rock cuttings were not excavated beyond this blockage. A partial collapse of the blockage of Rock Cutting 100 created a small breach in which another cavity is vissible. This hints that the rock cuttings were part of a burial complex that only partially exposed. A wall segment built of large fieldstones was discovered at the top of the spur, slightly to the southwest of the rock cuttings; it was cleared, but not fully excavated. Area B (Figs. 6–8). The area extended along the foot of a cliff, on the eastern slope of the northern spur. Large chunks of chalk, covered with a layer of nari, were discerned in the excavation area. It seems that these chunks were part of the collapsed ceiling of a cave. Two superimposed layers of tamped earth (L206, L211) were exposed in a narrow strip between the cliff and the chunks of chalk. 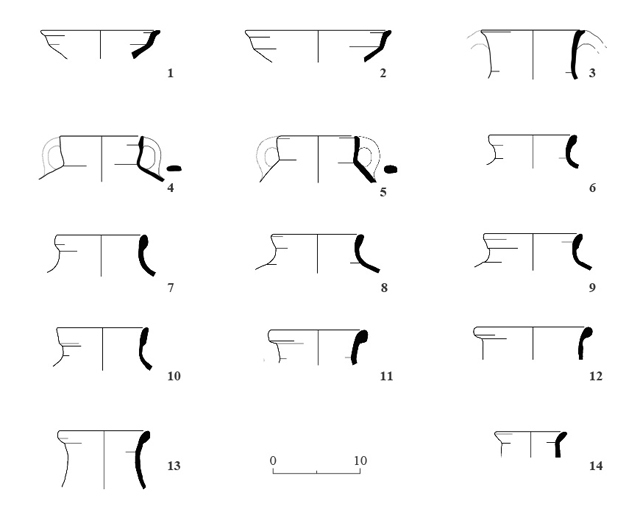 Pottery sherds dating mainly from the late Hellenistic and Hasmonean periods (mid-second to the early first centuries BCE) were discovered in a soil fill (L200) above the upper layer of tamped earth (L206). These include four or five in situ jugs (Figs. 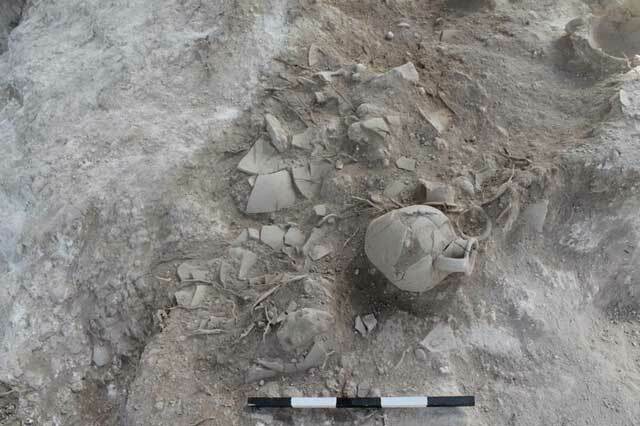 9; 10:9–16) surrounded by numerous fragments of other in situ pottery vessels, comprising mostly cooking pots (Fig. 10:2–5), an amphora (Fig. 10:6) and jars (Fig. 10:7, 8). In addition, a cooking pot (Fig. 10:1) from the early Hellenistic period, a lamp from the Early Roman period (Fig. 10:17), a few jars (Fig. 10:18, 19) and a jug from the Roman period (Fig. 10:20), as well a bowl (Fig. 10:21) and a mortarium (Fig. 10:22) from the Byzantine period, were recovered from the fill layer (L200). 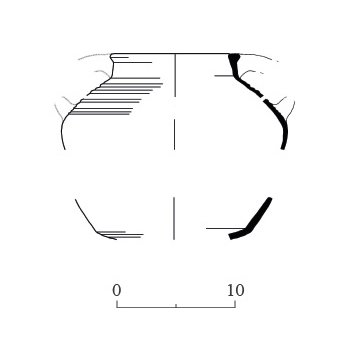 A layer of soil fill (L209) discovered between the two layers of tamped soil yielded many numerous pottery sherds dating mainly from the late Hellenistic and Hasmonean periods (Fig. 11). These belonged to bowls (Fig. 12:1, 2), cooking pots (Fig. 12:4, 5), jars (Fig. 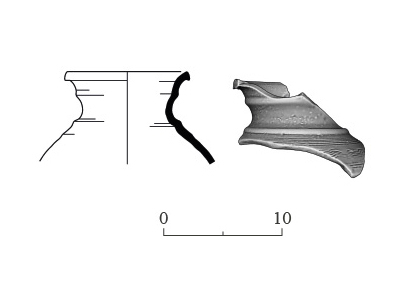 12:6–11) and jugs (Fig. 12:12–14). One of the cooking pots (Fig. 12:3) is slightly earlier than the rest of the vessels; this type first appeared in the early Hellenistic period. No pottery sherds postdating the Hellenistic and Hasmonean periods were discovered in Fill 209, suggesting that the layers of tamped soil date from these periods. When some of the chunks of chalk were manually broken up, it became clear that the stratified soil levels and the earth fill between and above them continued below the chunks; it therefore seems that the when the cave that was previously situated there was used either as a dwelling or for storage. 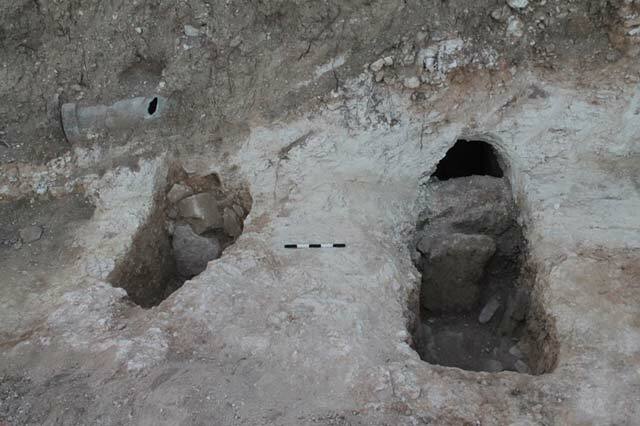 Collapsed building stones (L205) were discovered above and between two large chunks of chalk in the southern part of the excavation area. A jar rim from the Byzantine period was retrieved from amongst the building stones (Fig. 13), and a bronze coin of Valentinian II (383–392 CE; IAA 158843) was discovered on the surface near the stones. 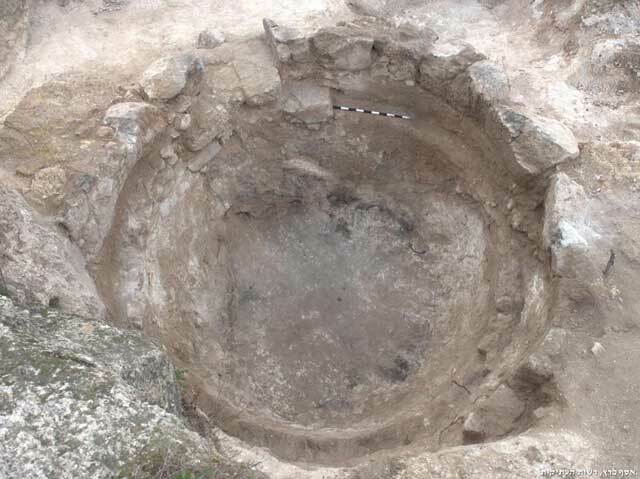 After removing some of the fallen stones, a soil fill (L210) containing a whole cooking pot from the Byzantine period (Fig. 14) was found between the chunks of chalk. 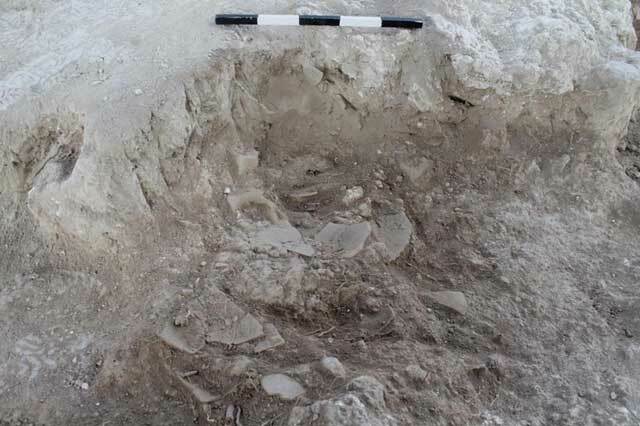 Upon completion of the excavation, the chunks were removed by mechanical means, and it became clear that the collapsed building stones (L205) continued further to the south. A jar rim from the Byzantine period (not drawn) was discovered directly below one of the removed chunks. Small chunks of chalk and a fill of soil (L201) overlying the soft chalk bedrock were exposed in the eastern part of the area. Among the finds in Fill 201 were small pottery sherds, dating mainly from the Late Roman and early Byzantine periods. These included bowls (Fig. 15:2–4; Ring Base 4 may have belonged to Rim 2), a basin (Fig. 15:5) and a fragment of a terra-cotta pipe (Fig. 15:6). In addition, a single fragment of a cooking pot rim (Fig. 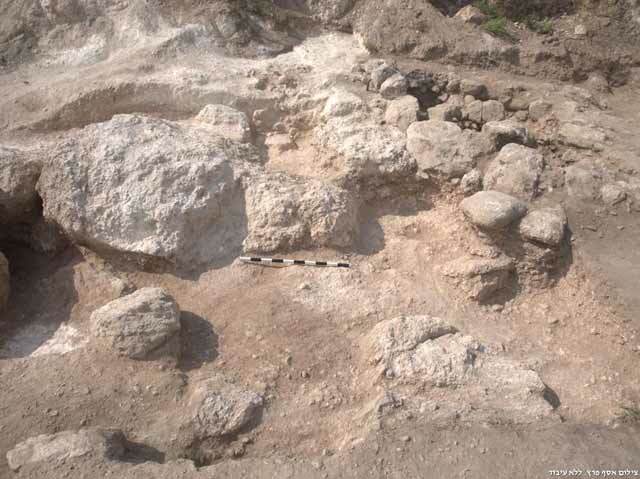 15:1) from the late Hellenistic and Hasmonean periods was discovered in Fill 201. Neither the tamped-earth layers (L206, L211) nor any whole pottery vessels or large sherds were discovered in this part of the excavation. A limekiln pit (L212; max. diam. c. 4.3 m; Figs. 16, 17) was unearthed in the northern part of the excavation area. Within it was alluvium and a dense fill of large stones, some dressed and others burnt; these probably originated in the ancient buildings at Horbat Gannim and were taken as raw material to be burnt in the installation. Following the removal of the fill, it was could be discerned that the lower part of the kiln’s pit was hewn in the soft chalk bedrock, and that two peripheral walls built one atop the other lined the upper part of the pit (Fig. 18). The upper wall (W202, W203, W218) was built of a single course of roughly hewn stones and boulders set on a step hewn in the bedrock. Part of the upper wall was burnt and covered with lime. The upper wall’s circumference was the widest in the kiln. The opening of a ventilation channel (L219; Fig. 19) was incorporated in the northeastern side of the upper wall. The lower wall (W220), built of two or three courses of small and medium fieldstones, was similarly founded on a hewn bedrock step. A thick layer of lime was found on the face of W220. Signs of burning were evident on the kiln’s wall, and large quantities of lime and ash were found at the bottom of the kiln. The southern wall of the kiln was constructed adjacent to one of the large chunks of chalk that fell from the ceiling of the cave; hence, it seems that the kiln was built after the ceiling collapsed; this may have happened due to the quarrying of the kiln’s pit. 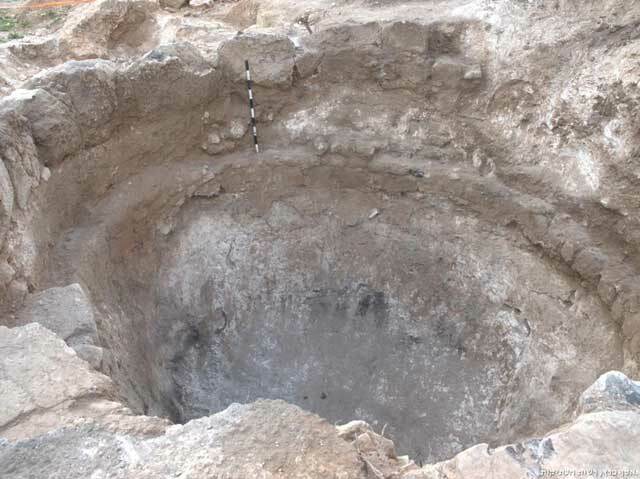 Judging by the chronologically homogenous finds from the bottom part of the kiln, it seems that the installation operated at the end of the Byzantine period or during the Early Islamic period at the latest. It is also possible that by this time the kiln was no longer being used, and was left exposed to the elements as debris began to fill it up. OSL samples taken from the depth of the kiln, near its floor, are likely to help in determining when the installation was quarried and when it was used. Two rock cuttings and a cavity,, probably part of a burial complex, were discovered in Area A. 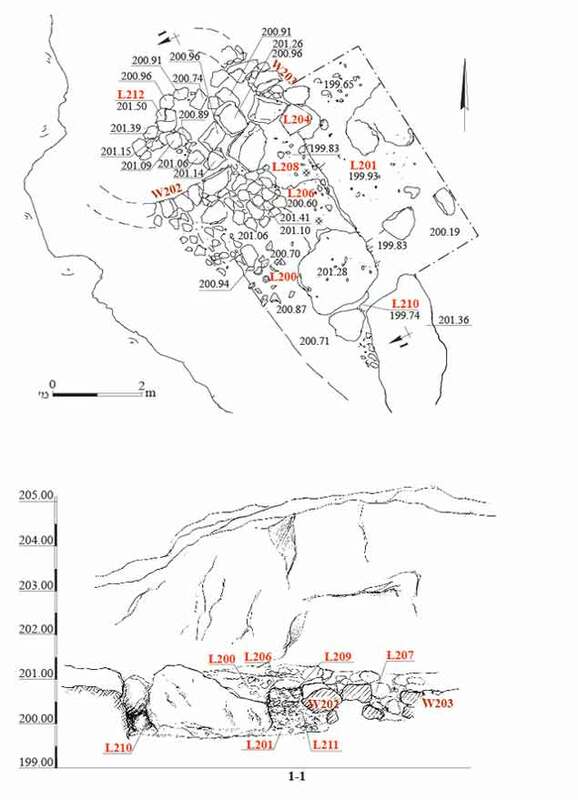 In Area B, habitation levels from the late Hellenistic and Hasmonean periods add to the architectural remains of these periods previously known at Horbat Gannim. It seems that these habitation levels were originally within a cave, the ceiling of which collapsed at a later time0. The few early Hellenistic potsherds discovered in the excavation may indicate that the settlement at the site began at that time. 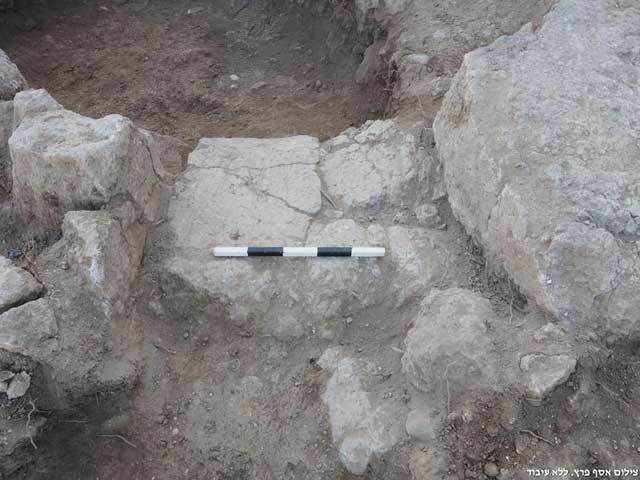 The finds from among the collapsed building stones and below the chunks of chalk in the southern part of Area B indicate that the cave collapsed during the Byzantine or the Early Islamic period at the earliest. The limekiln, which was installed near the habitation levels in Area B, may have caused the collapse of the cave, but may have been built afterwards. The kiln was probably used at the end of the Byzantine period or during the Early Islamic period at the latest. Ben-Ari N. 2017. Horbat Gannim. HA-ESI 129. Kogan-Zehavi E. 2010. Horbat Gannim. HA-ESI 122. Kogan-Zehavi E. 2016. Horbat Gannim. HA-ESI 128. Sion and Rapuano O. 2017. Horbat Gannim. HA-ESI 129. 3. Area A, plan and section. 4. Rectangular rock cuttings (L100, L103), looking southeast. 5. Rock Cutting 100, looking south. 7. Area B, looking southeast. 8. Area B, looking northwest. 9. A complete jug surrounded by numerous fragments of pottery vessels (L200), looking south. 10. Pottery sherds from Fill 200. 11. Fill 209 and a layer of tamped earth (L211) below it, looking north. 12. Pottery from Fill 209. 13. A jar from the Byzantine period. 14. A cooking pot from the Byzantine period. 15. Pottery from the eastern part of the excavation area (L201). 16. 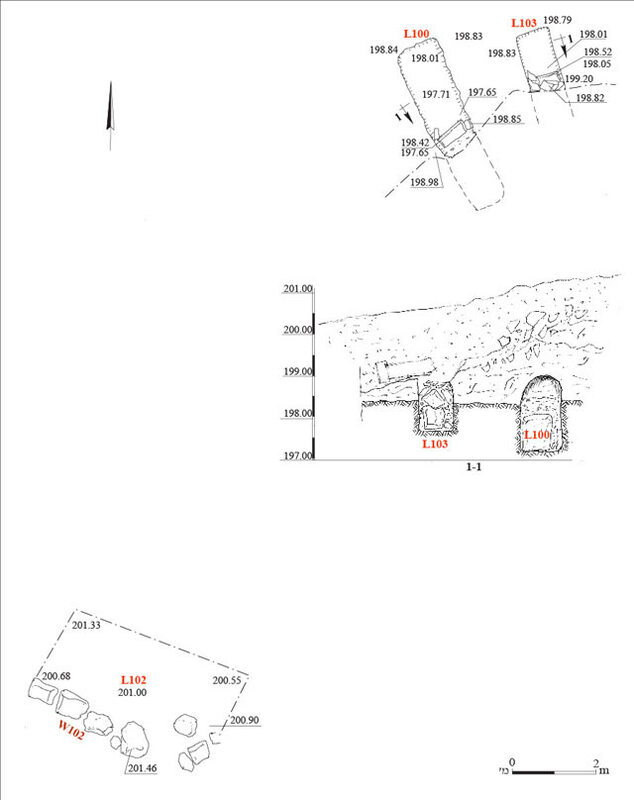 Limekiln 212, plan and sections. 17. Limekiln 212, looking northeast. 18. The two walls in the limekiln’s pit, looking south. 19. A ventilation channel incorporated in the upper wall of the kiln, looking west. 20. Pottery from Limekiln 212.